Among the many herbs and spices used to foster gut health is oregano. Derived from the Greek words “oros” (meaning mountain) and “ganos” (meaning joy), oregano was supposedly grown by the Greek goddess Aphrodite as a symbol of joy. Most known for its aromatic use in culinary dishes, oregano also has a history of medicinal application. As a matter of fact, many culinary herbs used for flavoring are important sources of micronutrients, which benefit overall health. Oregano extract, specifically, contains polyphenols and antioxidants, both of which help support overall immune health. Due to its potent antioxidant activity, this plant-based food has the ability to combat oxidative damage within the body. 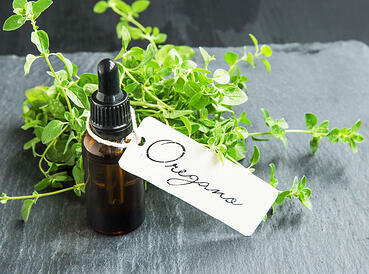 Also considered an antimicrobial agent, oregano extract slows down the growth of microorganisms such as E. coli. It also has antifungal properties, restraining growth of certain fungi. This extraordinary herb proves to be effective in eliminating bacteria. In addition, oregano extract supports healthy inflammatory responses. In fact, according to the Journal of Ethnopharmacology, 71 herbal substances from 63 plant species were assessed, and 61 of them revealed anti-inflammatory activity in the applied in vitro systems. One of those herbs involved Oregano extract. This research indicates that herbal substances such as oregano play a key role in supporting inflammatory responses. Moreover, oregano has been shown to improve gut health by enhancing greater nutrient absorption. Health Science reports that oral administration of oregano extract lessened mouse gastritis brought upon by cold-restraint stress. The study was conducted through mouse models of stress-induced gastritis. Oregano extract also reduced the number of bleeding points in the gastric mucosa of mice subjected to cold-restraint stress. Furthermore, according to a study from Phytotherapy Research where Oreganum Vulgare was administered to 14 adult patients that tested positive for enteric parasites, which included Blastocytis hoinis, Entameoba hartmanni and Endolimax nana, 6 weeks of supplementation with a daily dose of 600 mg of emulsified oregano oil had eradicated parasites in 12 subjects. Additionally, seven of the 11 patients who had tested for Blastocystis hominis improved their gastrointestinal symptoms. Made from leaves, oregano extract contains a high dose of phenols, natural phytochemical compounds with powerful antioxidant effects. Oregano extract also contains rosmarinic acid, an antioxidant that helps with free radical damage. Also considered to be a natural antihistamine, rosmarininc acid assists in reducing fluid buildup to improve allergic conditions associated with the immune system. The two most prevalent phenols in oregano extract are thymol and carvacrol. Thymol is a substance with significant antiseptic properties, which guards against toxins to enhance the immune system. A vital compound, thymol is one of the most important components in oregano extract. Carvacrol has antimicrobial, analgesic, and anti-inflammatory properties, which helps stave off bacteria to enhance digestive health. This is a key ingredient that aids in helping support a healthy microbiome. Research shows carvacrol can also help slow down different human and animal viruses in vitro. Thymol and carvacrol also slow down Staphylococcus aureus, a bacterium known to produce respiratory infections. According to Mediators of Inflammation, an examination of anti-inflammatory effects of the combinations of thyme and oregano essential oils was conducted. The oils were administered at three concentrations (0.4% Thyme and 0.2% oregano oils, 0.2% thyme and 0.1% oregano oils; 0.1% thyme and 0.05% oregano oils) on mice with Trv BS-induced colitis. The study showed that administration of these essential oils to collitic animals decreased the mRNA levels of pro-inflammatory cytokines IL-1B, 1L-6, GM-CSF, and TNFa, especially after medium dose application, as it noticeably lowered the amount of IL-1B and IL-6 proteins too. In addition, the medium dose also decreased the mortality rates, enhanced body weight gain recovery, and reduced the macroscopic damage of the colonic tissue. This indicates that the combined treatment of thyme and oregano essential oils can reduce the production of pro-inflammatory cytokines and reduce the effect of TNBS-induced colitis in mice. With its unique antioxidant and antimicrobial properties, oregano extract is a plant-based substance that can optimize general health and well-being by supporting the both the immune system and a healthy microbiome.